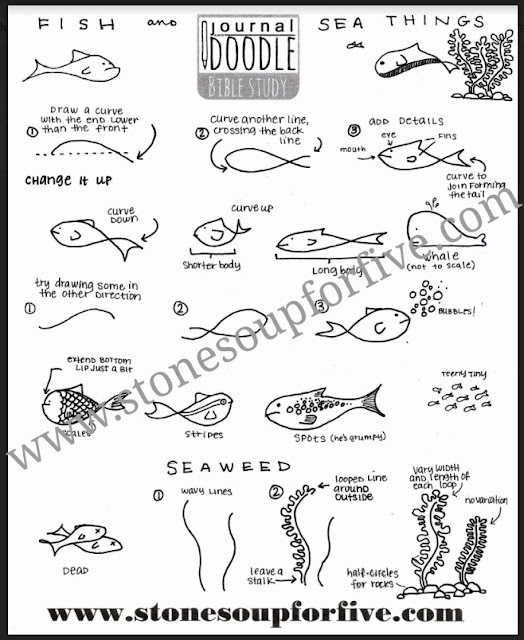 Stone Soup for Five: Doodle Wednesday! Fish! Never underestimate the power of a well placed fish on your journal pages. If you doodle some fish, be sure to share on social media with the hashtag #journalanddoodle. I love seeing them! Click on the picture above to get the printable PDF. Some ideas for your doodle section: landscapes (mountains, rivers, sun), manuscripts, writing utensils (pens, pencils), feathers, water, leaves, flowers, trees, umbrellas, boats, hearts, stars, arrows, nautical.